When a patient gets injured in one of a variety of different ways, therapy plays an essential role in managing those injuries. Whether you become an occupational therapist or a physical therapist, you will instruct your patients on ways to prevent or avoid injuries, while educating them on their healing processes. Physical therapists help their patients with their movement abilities and pain management. Occupational therapist enlist daily activities to help patients recover the skills they need to go about their day. 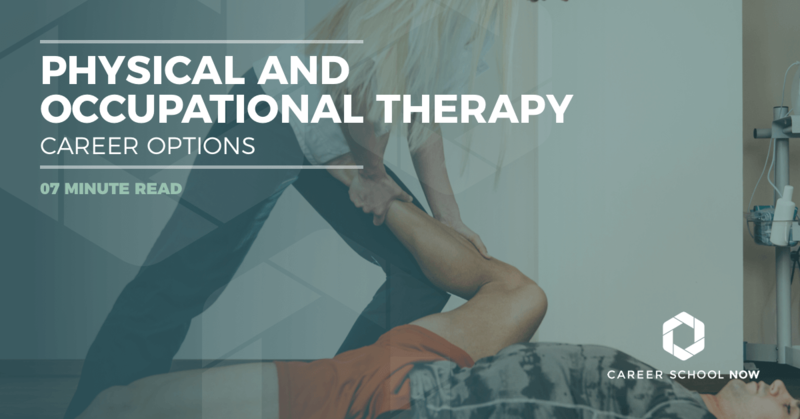 Both OT and PT treat and rehabilitate their patients who have chronic medical conditions. The main difference in the two careers is the schooling that’s involved. PT has a more intense educational path, including a postdoctoral degree, and OT needs a master’s degree. Find out more about the two similar yet different careers of occupational therapy and physical therapy. It doesn’t matter if your patients are from a professional sports team or they are postsurgical stay-at-home moms, you are there to help them get back on their feet. Literally. Your patients will lean on you as you help them restore their mobility after an injury or surgery (or both). Because you’ll have patients coming to you for quite a while, you really get to know them well, which some physical therapists will admit is a nice perk of the career. Explore the patient’s medical records along with the treating medical staff’s recommendations. Spend time observing your patient’s movements in order to come up with a diagnose. Create a plan of action along with expectations and projected outcomes. By using exercising, stretching, and other forms of therapy, to lessen pain and increase mobility. Evaluate your patient’s progress, and modify your plan as needed. Meet with the family of your patient to get them involved in recovery. Enroll in a bachelor’s degree program where you’ll major in anatomy, physiology, kinesiology, biology, chemistry, or physics (or any other related field). However, if you already know which doctoral program you plan to enroll in, then check with them to see which bachelor’s degrees are acceptable. Find a Doctor of Physical Therapy (DPT) program, if you haven’t already. There are around 230 programs accredited by the Commission on Accreditation in Physical Therapy Education. Apply to schools through the Physical Therapist Centralized Application Service. The DPT programs take approximately three years to complete. Complete your 30 weeks of clinical (hands-on) work. All states require PTs to become licensed, so do that now. After graduation, you have to option to apply to a resident program, which lasts a year. This will permit you to do a fellowship in an advanced area of physical therapy. Once you’ve gained some work experience, you can become a board-certified specialist. There are nine specialties you can consider including women’s health, orthopedics, sports, pediatric, and geriatrics. Once you’ve completed your education, you’ll find an entry-level PT job where you’ll earn, on average, more than $58K. After you’ve worked a few years, your salary will creep up to $85K, then hitting over the $122K mark after about ten years. The employment outlook for physical therapy is tremendous, at 25 percent through 2026. This translates to 60,000 job openings. It’s not uncommon to have job offers rolling in prior to even graduating from your doctoral program. There will be a whole slew of reasons patients need to see you, from illnesses through disabilities. You’ll work with them to improve their health and wellbeing via occupational therapy. Talking to your patient, finding out his or her medical history, and observing movements. Identifying the goals and creating a patient treatment plan to match. Helping patients with ways to better improve their living conditions, making their homes conducive to their needs. Recommending special equipment such as walkers, wheelchairs, or other devices. Teaching your patient how to use the prescribed devices. Recording your patient’s progress for the treating medical staff and insurance billing. Complete your bachelor’s degree. Some graduation requirements include physiology, biology, and kinesiology. Work as a volunteer in an occupational therapy setting. Go on for your Master of Occupational Therapy. This takes two to three years. Complete six months of a supervised fieldwork study program. Take and pass the national exam given by the National Board for Certification in Occupational Therapy (NBCOT). Consider specializing in areas such as vision, pediatrics, geriatrics, or mental health. You may have to spend quite a bit of time in school, but you’ll earn an average salary of $54K once you graduate and pass the NBCOT to become a licensed OT. Once you have worked for a few years, your salary will start going up to the national median of $82K. After ten years or so, you will be bringing in around $120K. These are approximations based on a survey through the Bureau of Labor Statistics. Your real-life salary may look very different depending on where you live, your experience, and the industry you’re employed with. The employment growth projected for OT is 21 percent, which means there will be more than 27,700 jobs. This is much faster than the average for other occupations. One of the reasons driving this growth is longevity and active lifestyles of the baby boomer generation. To almost guarantee a job in this rapidly growing yet extremely competitive field, specialize. As either a PTA or OTA, you’ll work with the therapists to provide treatment to patients. Your job will be extremely hands on as you guide your patients along their journey to a healthy and relatively pain-free life. You’re very interested in a physical therapy career, but you really don’t want to spend the next seven years in school. Well, you can have your cake and eat it too by deciding to become a physical therapy assistant (PTA). Therapy assistants help patients develop, recover, and improve the skills needed for daily living and working activities. Therapy assistants are directly involved in providing therapy to patients, working under the direction of a physical or occupational therapist. When you’re searching for an associate degree program, make sure you pick one that’s accredited. That will make a huge difference when you go to take the required licensing exam (unless you’re in Hawaii). Go to a community college or trade school for the physical therapy assistant program. It shouldn’t be too terribly hard to find one: There are over 350 accredited programs in the country. Your program should also include a supervised hands-on clinical portion. After two years of full time school, you’ll graduate with your associate degree. Now it’s time to sit for and pass the licensing exam given through the Federation of State Boards of Physical Therapy. Once you’re licensed, it’s time to find yourself employment. You can choose to specialize in areas such as pediatrics, geriatrics, aquatic, and more. When you’re just starting out in your career journey, the average salary you’ll receive is more than $34K. However, once you’re established, and you have time and experience on your side, then you’ll start making more than $56K. After ten years, you can expect a salary of more than $79K. These numbers are what is typical, but depending on where you work and how much experience you have, your salary may be higher or lower. It’s a great time to choose to become a physical therapy assistant, because the job outlook is projected to be 31 percent through 2026. This means there are more than 42,000 job openings expected. Look for gigs in long term care facilities and nursing homes; that’s where a majority of the jobs will be. As you already know, you’ll be working underneath a certified occupational therapist. Even still, you will need a certain amount of education and training to be prepared for this career. Choose an accredited occupational therapy assistant program through a community college or trade school. The program you’re enrolled in must include 16 weeks of hands-on fieldwork. Most states will require you to be licensed in order to work as an OT assistant. Take continuing education to keep your license up to date. Consider going back to school to advance your career by getting either a bachelor’s or master’s degree. By mid career, you’ll be earning more than $59K. However, when you’re just starting out your OT assistant career, you’ll be making a bit over the $39K mark. But with just a few more years of experience, you can earn as much as $80K. These numbers are purely an average. You, on the other hand, could be earning much more than that, it just depends on your location and experience. There will be more than 11,400 available jobs through 2026. OT assistant careers are predicted to grow 29 percent, which is faster than the average for other occupations. The baby boomer population is growing, and therefore, so are injuries and illness related to aging bodies. To become fully licensed, students must graduate from an accredited school. Most OT and PT classes need to be taken in a physical classroom. There are no accredited online courses at this time. Students interested in physical therapy should look for schools accredited by the Commission on Accreditation in Physical Therapy Education (CAPTE), while those interested in occupational therapy should enroll in a school accredited by the American Occupational Therapy Association (AOTA).